I just love these Kenner conceptual drawings. Stylistically, they have a lot of pizzazz, and the artists always took special care to infuse them with a dynamic sense of motion. 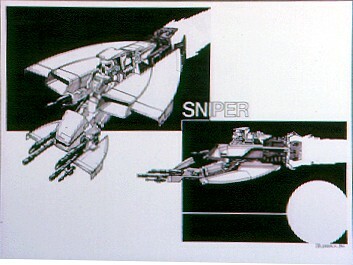 This one shows an early design for what would become the Power of the Force line's Imperial Sniper mini-vehicle. It doesn't look a whole lot like the production Imperial Sniper, however, although it does incorporate some similar features. In fact, certain aspects of the vehicle in this drawing (the clamps around the head, for instance), seem more related to other mini-vehicles from the POTF line, such as the Security Scout. I'm guessing here, but this was probably made at a point very early in Kenner's development of the POTF mini-vehicle line. They may very well have started out with a design like this and incorporated elements of it into both the Security Scout and Imperial Sniper. It's also interesting to note here the vague similarity between this early Sniper drawing and Hasbro's Cruise-Missile Trooper toy, released around 1996.